Shortly after arriving back from their honeymoon, Choco and Rambo were pleasantly surprised to find out they were expecting their first child. With the looming thought of fatherhood and having clinical O.C.D., Choco started scurrying around to find as much information as he could in order to support Rambo through pregnancy (and equally to calm his growing anxiety!). 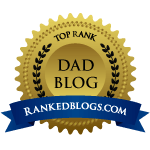 Being so new to pregnancy and not necessarily finding as much readily available information for first time dads as he would have liked , Choco began to chronicle his own trials and tribulations through his blog. Choco hopes his amusing approach to blogging will provide much needed support and empower dads on the importance of their role in pregnancy and parenting. Choco can be found on Twitter, Facebook and Instagram. Thanks for visiting and following my blog. What an exciting time for you and Rambo! Love the nickname, by the way. Congratulations, and more importantly, good luck! Congrats and best wishes! Blogging is a great way to keep laughing and connecting with others in the adventure of being a parent! Thanks for following Born in My Heart: A Bittersweet Adoption Memoir! Congratulations on your upcoming first baby and enjoy!!! I’d like to invite you to be a guest on my blog. This is a good way to help you increase traffic to your website and twitter. Maybe you could do the same for me. Good luck Choco. Something I remember hearing that all parents love their children and that parental love is unconditional but perhaps there will be a day when the rest of the world loves your child… and then you know you’ve done a good job as a parent.